Home / Blog / Black Friday Weekend Sale – Up to 70% Off. What Are You Waiting For? Powerful RSJoomla! extensions and unique responsive templates are offered only now at 35 to 70% off the normal price. 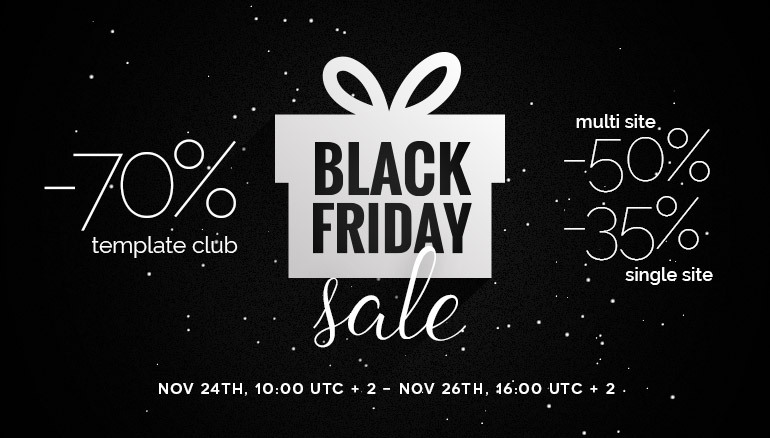 Promotion is valid from the 24th of November 10:00 UTC+2 until 26th of November 2017 23:59 UTC+2 (this weekend!). 35% OFF on all single-site licences and templates (templates also come with a free RSMediaGallery! extension licence for 12 months). No coupon code required. As long as the promotion is available, the discount will be applied automatically. The discounts are applied for new purchases only, not license renewals.